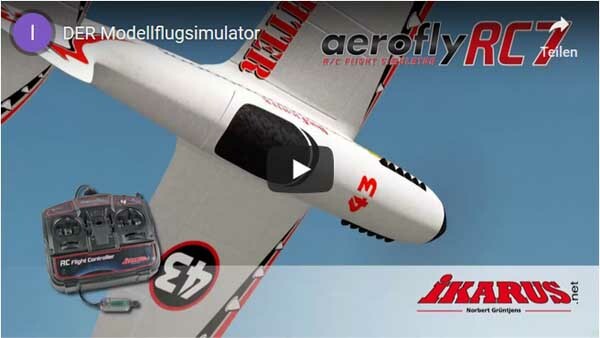 The follow-up to the famous aeroflyRC7 is completely consummated with great new models, fantastic new 4D sceneries, innovative technical highlights and many new features. • 246 Models • 54 Sceneries • 8 x 4D-Sceneries • Normal mode for PC monitor • 3D mode for VR headsets (Virtual Reality) • FPV parcours for multi copter • Race track for all models • Auto gyros, Power trike, rectractable engine, Flettner roto wing • Helis, Jets, Multi copter, Aerobatics, Glider, Scale models, Sea planes, True scale models • Super real reflections and super real Dynamic effects • For all IKARUS-RC FlightController or -Interfaces. The aeroflyRC7 is perfect for beginners and pros, training your skills and having fun. Aerobatics, helicopter, jets, gliders, scale models, indoor and multicopter.